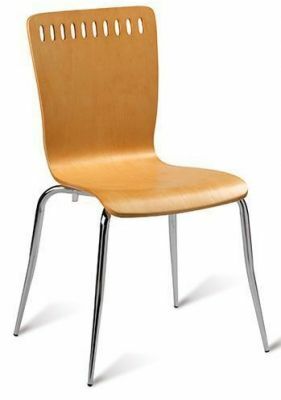 Durable chair designed for busy high end venues. The chair includes an unusual slot feature on the upper back. Thick plywood seat supported by strong tubular chrome legs. Original design bistro chair with designer slots on the upper back of the plywood structure. The seat and back are constructed from thick plywood for extra strength. Molded for a comfortable sit. Conveniently held in stock for a speedy and free UK delivery. Please enquire for further information on this item.